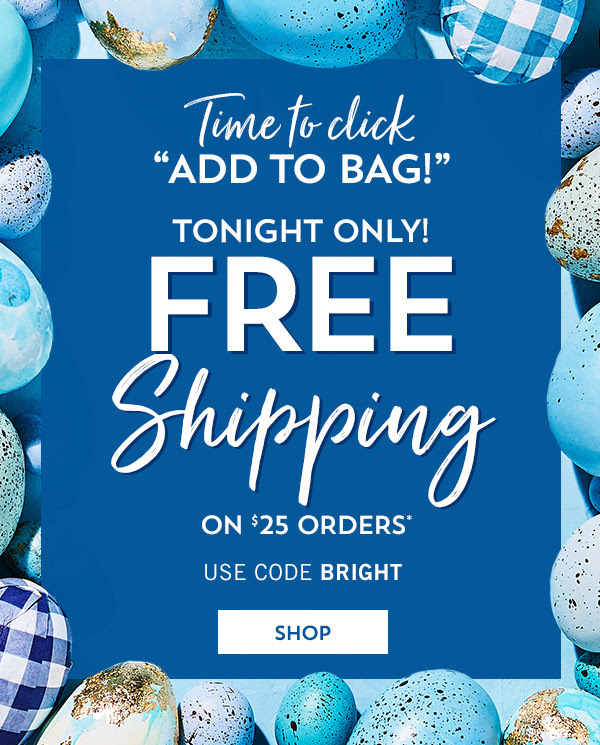 Bath & Body Works Canada has a awesome offer available today only, April 18, 2019, where you can get FREE shipping on orders of $25.00 or more, using the promo code BRIGHT at checkout. Also, 3-Wick Candle, Buy 2, get 2 FREE Select Body Care, Buy 3, get 3 FREE Click here to find Bath & Body Works Canada near you. 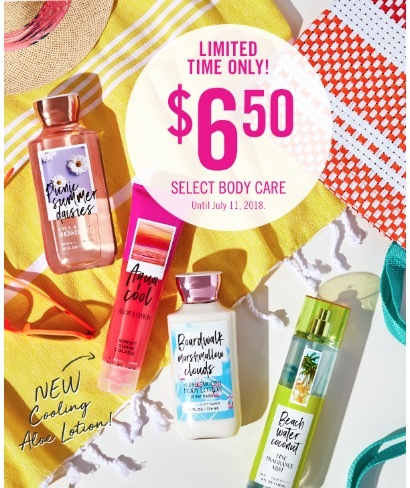 Bath & Body Works Canada has a great deal available today! using . Simply show on your phone or print and present coupon at register. This coupon is valid today, April 17, 2019. Limit 15. While supplies last. Click here to find Bath & Body Works Canada near you. Bath & Body Works Canada has great deals available now! any $30 purchase using . Simply show on your phone or print and present coupon at register. This coupon is valid until, April 15, 2019. Furthermore, Bath & Body Works has more deals that include: All Body Care, Buy 3, Get 3 Free 3-Wick Candles, $13.95 These deals are valid for a limited time, while supplies last. Click here to find Bath & Body Works Canada near you. Bath & Body Works Canada has a new deals Deals available now where you can get FREE items with $10 purchase. Click here to find Bath & Body Works Canada near you. 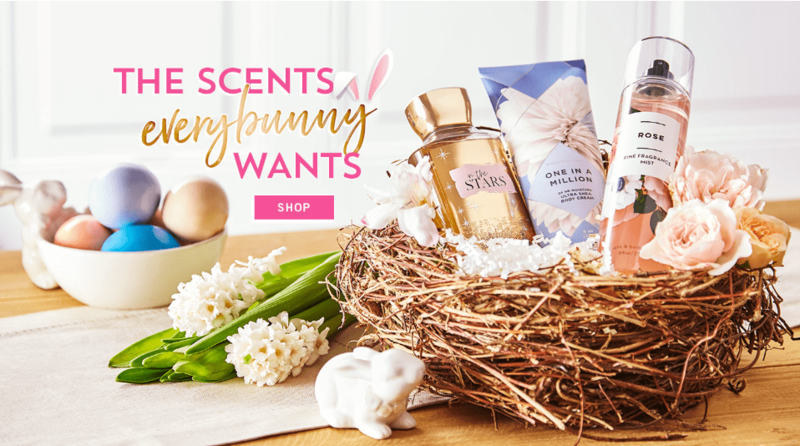 Bath & Body Works Canada has great deals available now! First, you can any $30 purchase using . Simply show on your phone or print and present coupon at register. This coupon is valid until, March 29, 2019. Furthermore, Bath & Body Works has more deals that include: Select Body Care, Buy 3, Get 3 Free 3-Wick Candles, $13.50 Hand Soaps, 6 for $22 These deals are valid for a limited time, while supplies last. Click here to find Bath & Body Works Canada near you. Bath & Body Works Canada has a new Coupon available now that includes: : Get Concentrated Room Sprays for $3.50. Limit 15, while supplies last. Valid Wednesday, March 27, 2019, only. 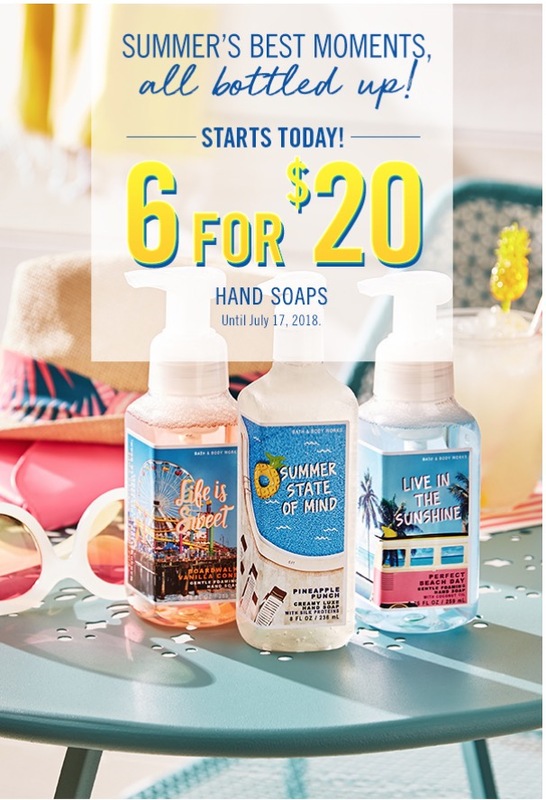 Also, Bath & Body Works has more deals that include: Hand Soaps, 6 for $22 Select Body Care, Buy 3, Get 3 Free These offers are valid, while supplies last. Click here to find Bath & Body Works Canada near you. 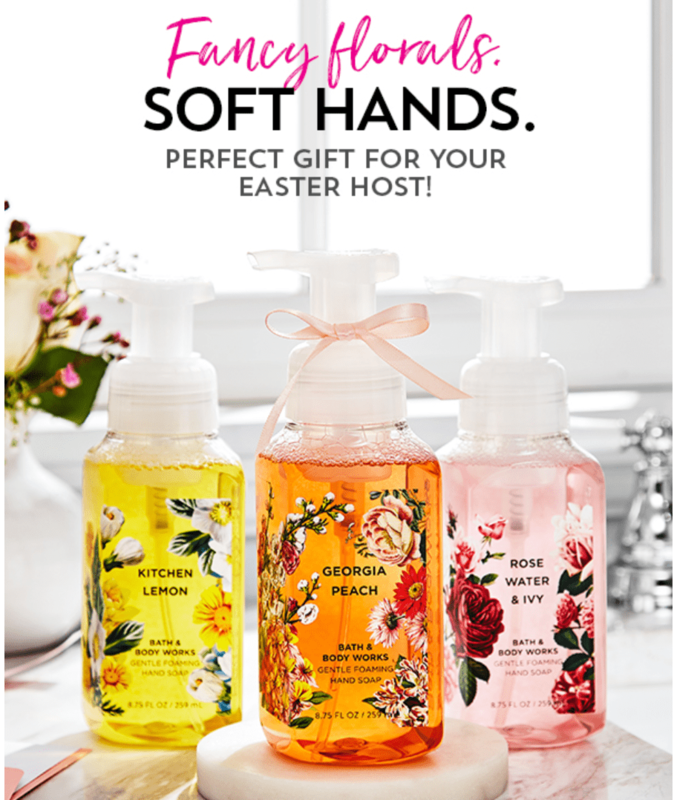 Bath & Body Works Canada Coupon: $4.95 for Shower Gel or Body Wash + Buy 2, Get 2 FREE Wallflowers Fragrance Refills + More Deals! 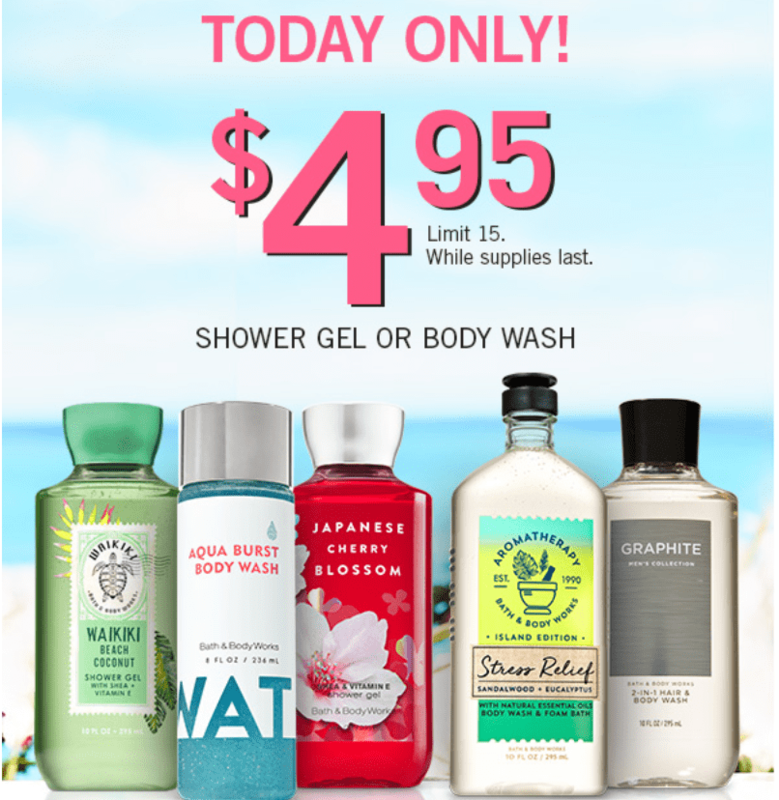 Bath & Body Works Canada has a available today only – Shower Gel or Body Wash, for $4.95. Limit 15, while supplies last. Valid Tuesday, March 19, 2019, only Also, Wallflowers Fragrance Refills, Buy 2, Get 2 Free Select 3-Wick Candles, $15 Select Body Care, $10 These offers are valid, while supplies last. Click here to find Bath & Body Works Canada near you. 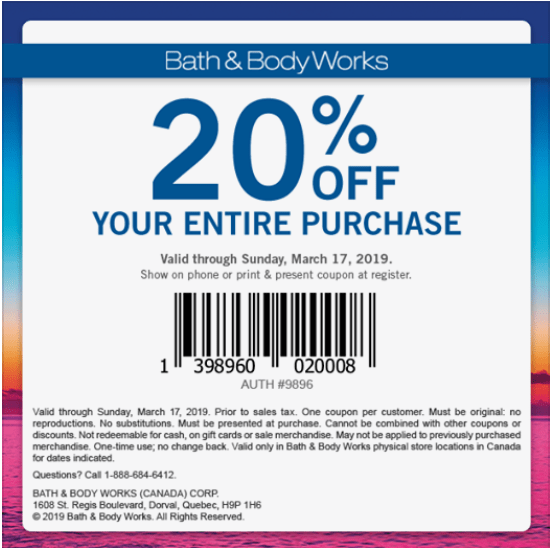 Bath & Body Works Canada has a new Coupon available now that includes: : Save 20% off your entire purchase. 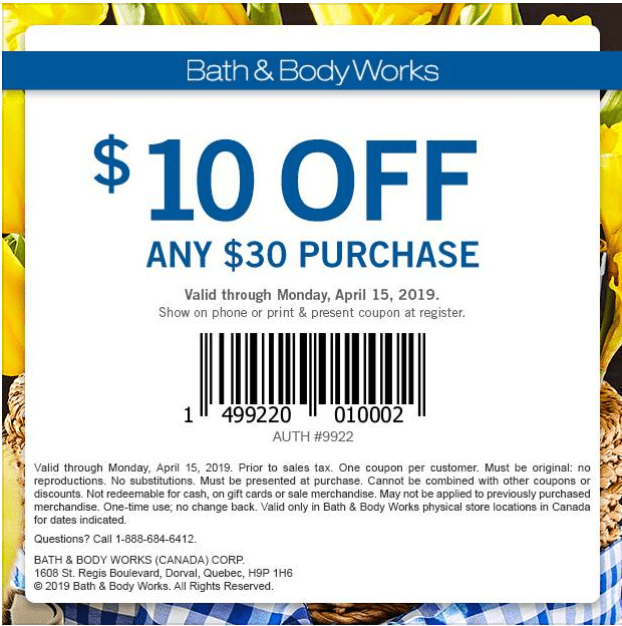 The Bath & Body Works Canada coupon valid now until March 17, 2019, in-stores only, on selected styles, while supplies last. Selection may vary by store location. Click here to find Bath & Body Works Canada near you. 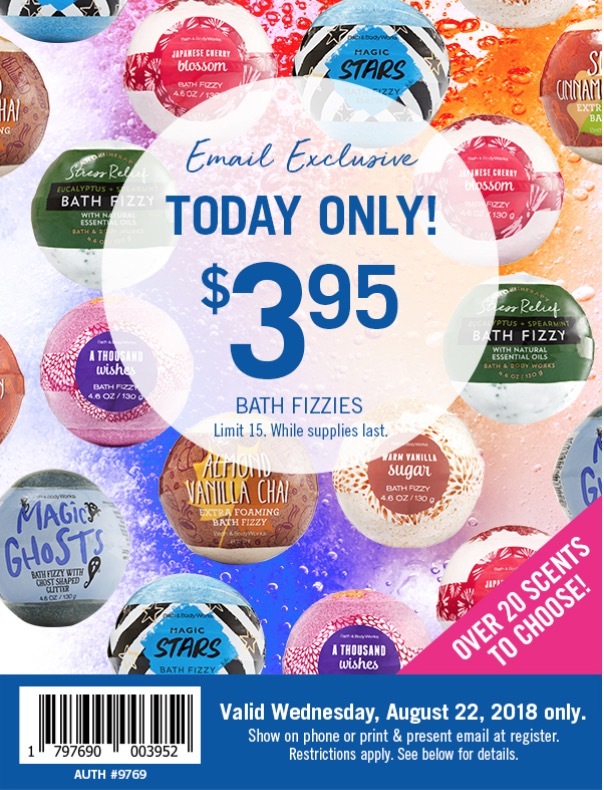 Bath & Body Works Canada has released some great deals available today only! First, you can any $30 purchase using . Simply show on your phone or print and present coupon at register. 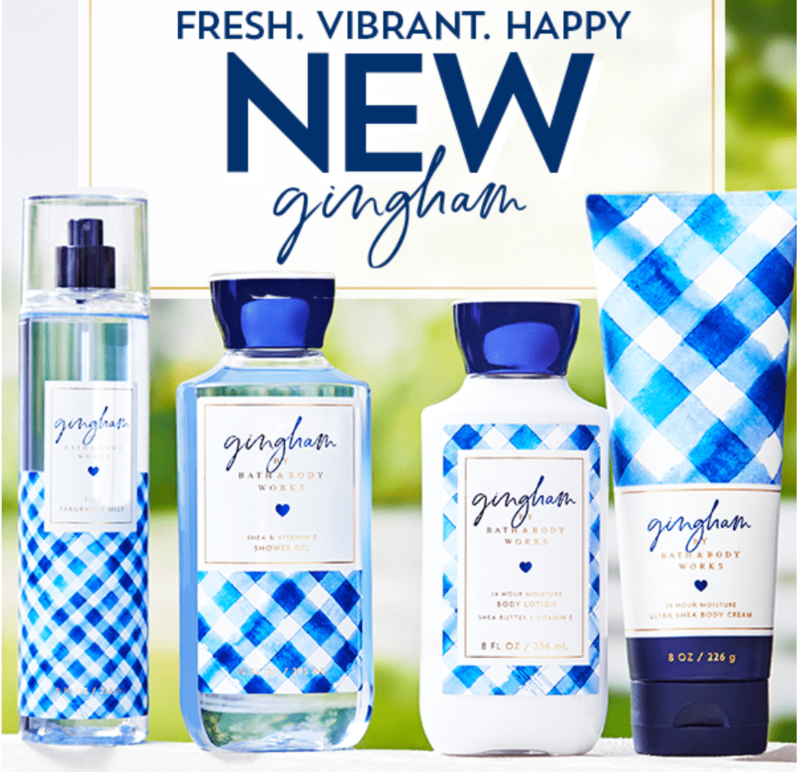 Furthermore, Bath & Body Works has more deals that include: 3-Wick Candles, $10 Off Wallflowers Fragrance Refills, 7 for $28 or 5 for $23 Water Mineral Body Polish, $10 These deals are valid today, January 27, 2019. Click here to find Bath & Body Works Canada near you. Today at Bath & Body Works Canada you save 20% off any $25 purchase using the coupon above! This coupon is valid until January 17 2019 and must be presented at purchase. One coupon per customer. Click here to find a Bath & Body Works Canada near you. 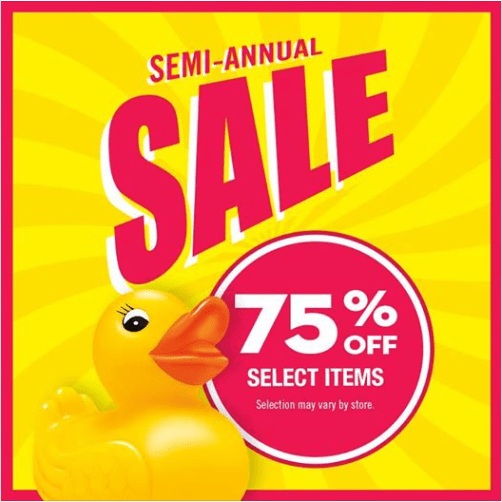 Bath & Body Works Canada has an awesome Semi-Annual Sale available now with great offers that include: Select Body Care, 3 for $15 or $7 each Select 3-Wick Candles, $11.95 Select Items, 75% Off The Bath & Body Works Canada offers are valid now until January 4, 2019, in-stores only, on selected styles, while supplies last. Selection may vary by store location. Click here to find Bath & Body Works Canada near you. Bath & Body Works Canada has a new offer available today only, December 13, 2018, that includes: All Hand Cream for Just $1.95. Limit 15, while supplies last. Also, Wallflowers Fragrance Refills, 7 for $28 or 5 for $23 White Flowertop Fragrance Plugs, $4 3-Wick Candles, 3 for $38.50 or 2 for $28.50 The Bath & Body Works Canada offers are valid in-stores only, on selected styles, while supplies last. Click here to find Bath & Body Works Canada near you. 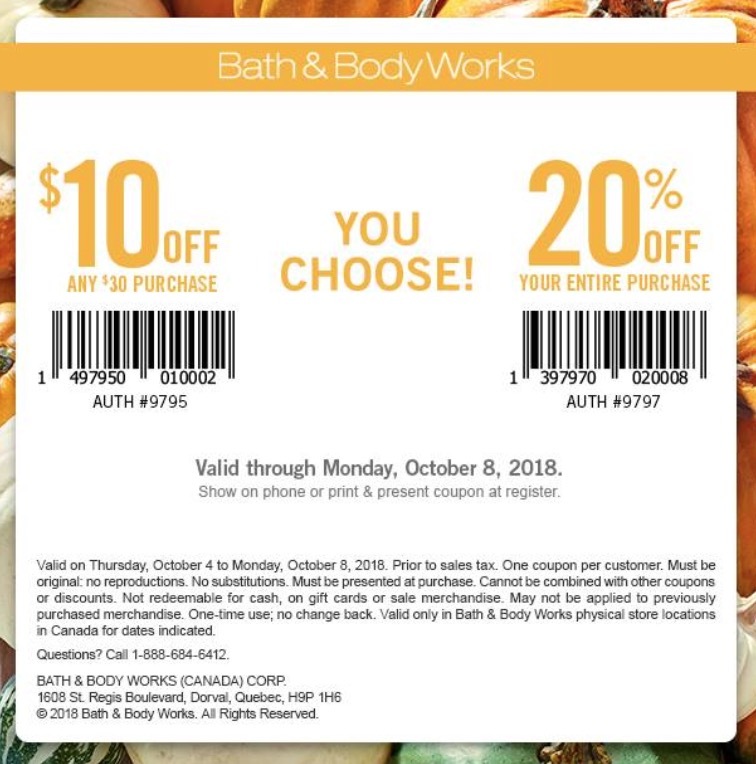 Bath & Body Works Canada has a new Coupon available now that includes: : Save 20% off your entire purchase. 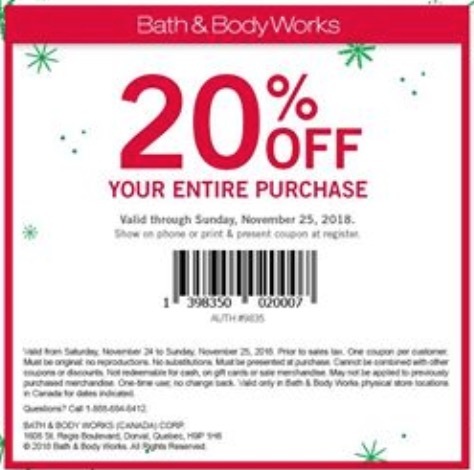 The Bath & Body Works Canada coupon valid today, November 25, 2018, in-stores only, on selected styles, while supplies last. Selection may vary by store location. Click here to find Bath & Body Works Canada near you. 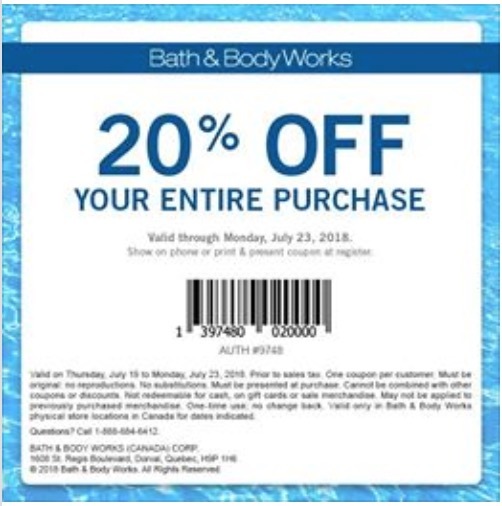 Bath & Body Works Canada has a new Coupon available now that includes: : Save 20% off your entire purchase. The Bath & Body Works Canada coupon is valid until October 24, 2018, in-stores only, on selected styles, while supplies last. Selection may vary by store location. Click here to find Bath & Body Works Canada near you. 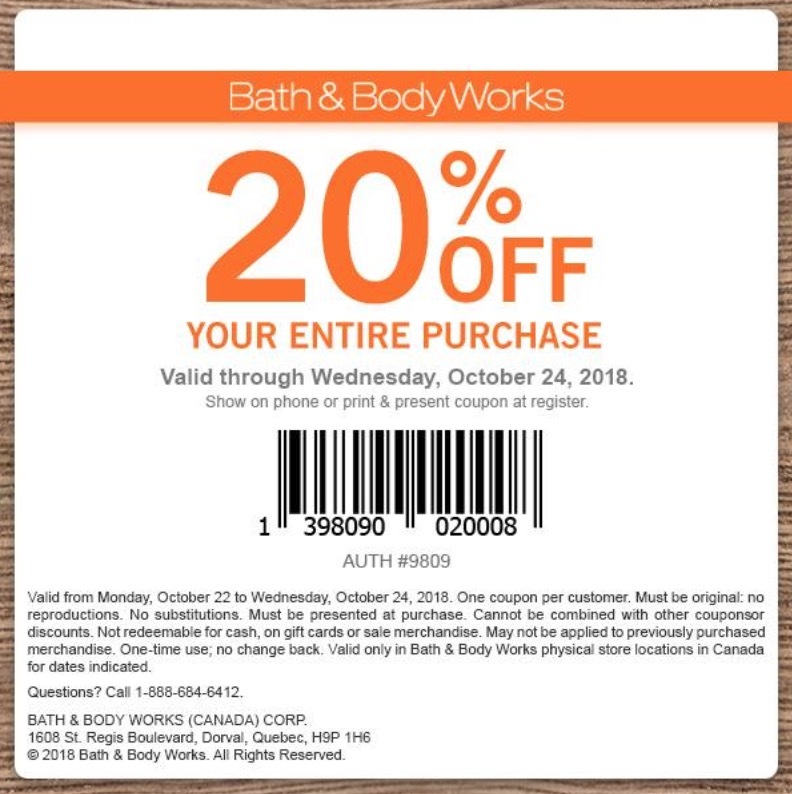 Bath & Body Works Canada has a new Coupon available now that includes: : Save 20% off your entire purchase. The Bath & Body Works Canada coupon is valid until October 14, 2018, in-stores only, on selected styles, while supplies last. Selection may vary by store location. Also, while supplies last: 3-Wick Candles, Buy 1, Get 1 FREE Select Body Lotions, $6 Click here to find Bath & Body Works Canada near you. 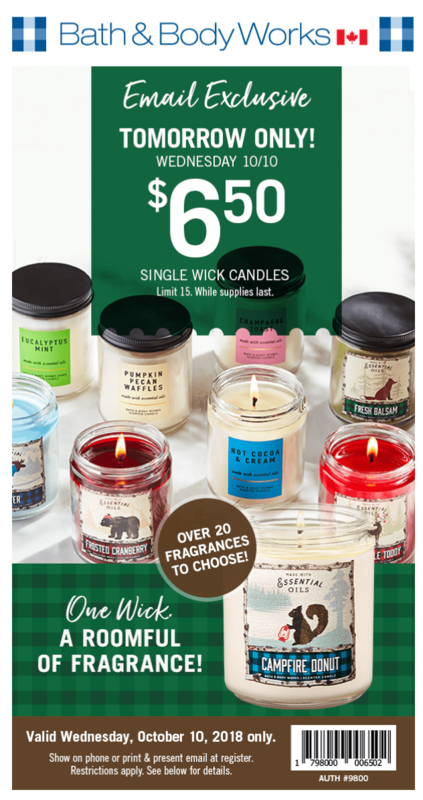 Today at Bath & Body Works Canada you can get single wick candles in-store for only $6.50 using the coupon above! This coupon is valid today only and you must show it on your phone or print and present at register. Limit 15. While supplies last. Valid Wednesday, October 10, 2018 only. You can also get 3-wick candles for $11.95, and buy 3 get 3 free on body care products. Click here to find a Bath & Body Works Canada near you. 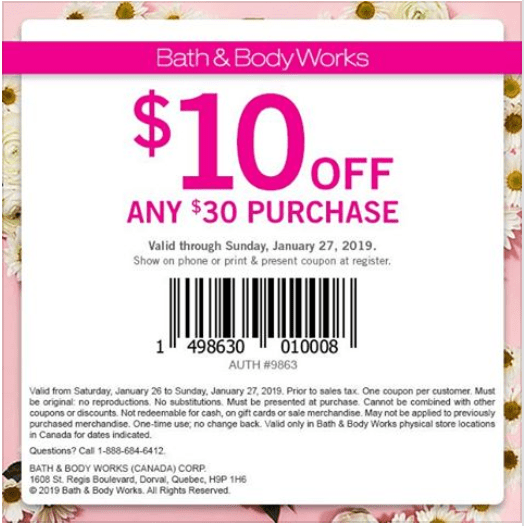 Bath & Body Works Canada has new Coupons available now that includes: : $10 off any $30 Purchase. 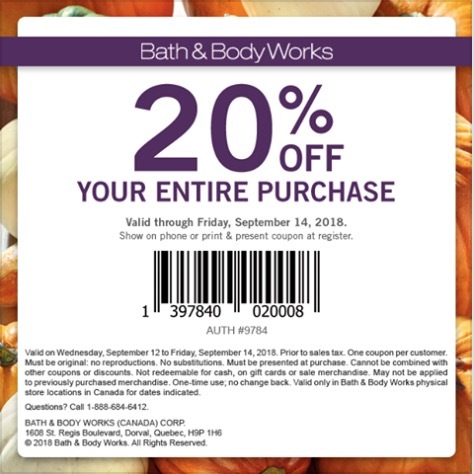 and Save 20% off your entire purchase The Bath & Body Works Canada coupons and offers are valid until October 8, 2018, in-stores only, on selected styles, while supplies last. Selection may vary by store location. Show the coupon on your smartphone to redeem. Click here to find Bath & Body Works Canada near you. 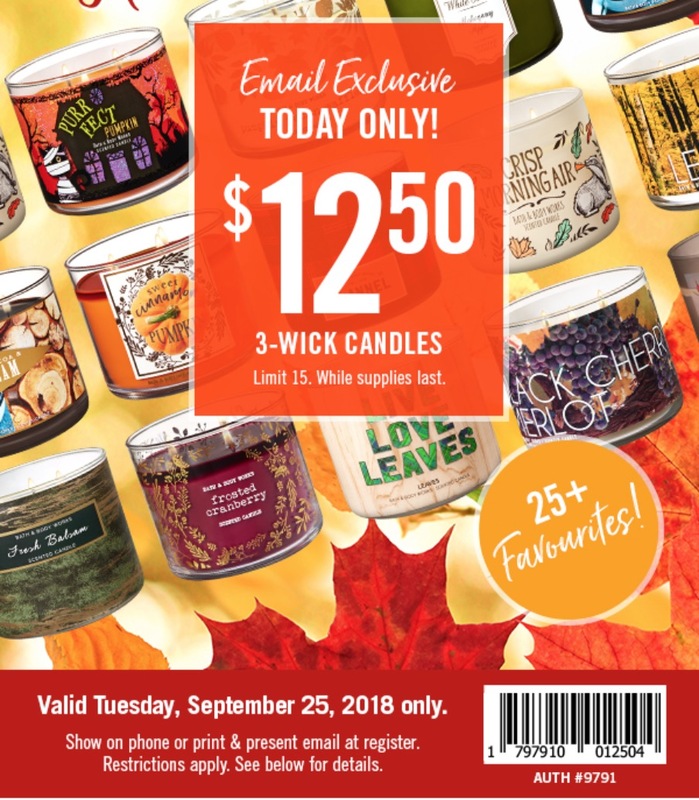 Bath & Body Works Canada has a new coupon and offers available today only, that includes: Get 3-Wick Candles for Just $12.50 Save 50% off 3-Wick Candles Sleeves The Bath & Body Works Canada offers are valid today only, September 25, 2018, in-stores only, on selected styles, while supplies last. Click here to find Bath & Body Works Canada near you. 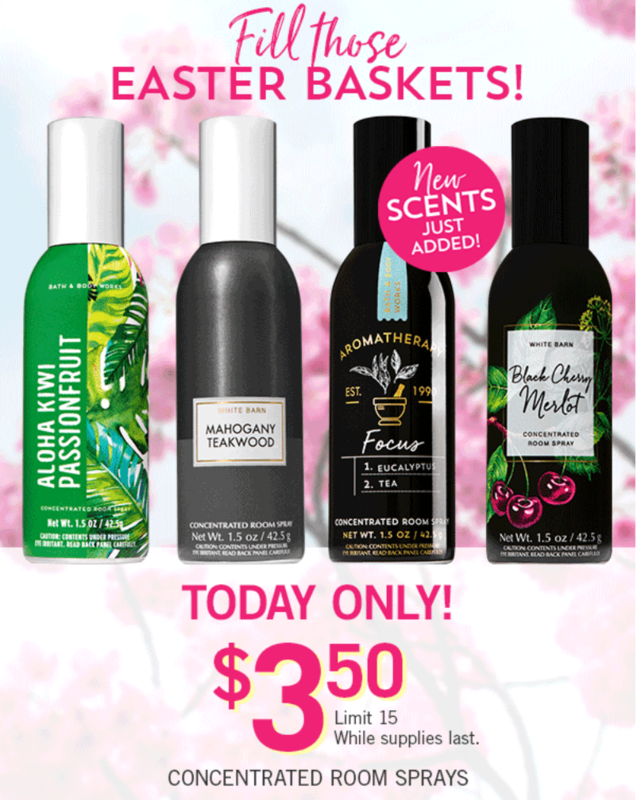 Bath & Body Works Canada has new offers available today that include: Wallflowers Fragrance Refills for $2.95 each, Limit 15. 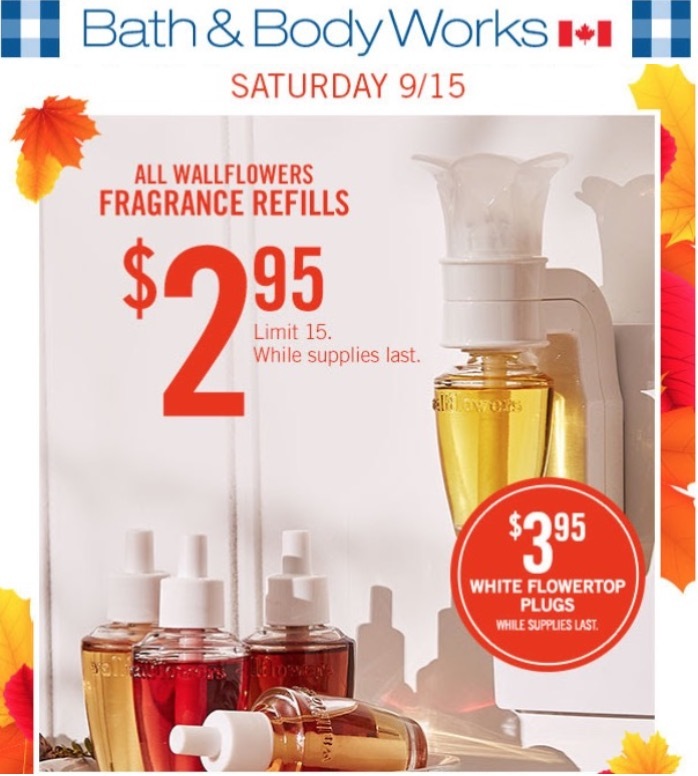 White Flowertop Fragrance Plugs for $3.95 each Wallflowers Leaf Fragrance Plugs, $5.95 The Bath & Body Works Canada offers are valid today only, September 15, 2018, in-stores only, on selected styles, while supplies last. Click here to find Bath & Body Works Canada near you. 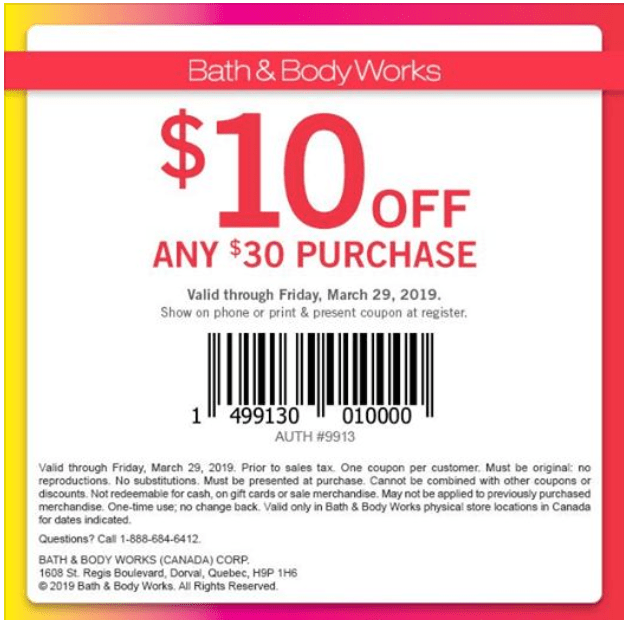 Bath & Body Works Canada has a new Coupon available now that includes: : Save 20% off your entire purchase. The Bath & Body Works Canada coupon is valid until September 14, 2018, in-stores only, on selected styles, while supplies last. Selection may vary by store location. Click here to find Bath & Body Works Canada near you. 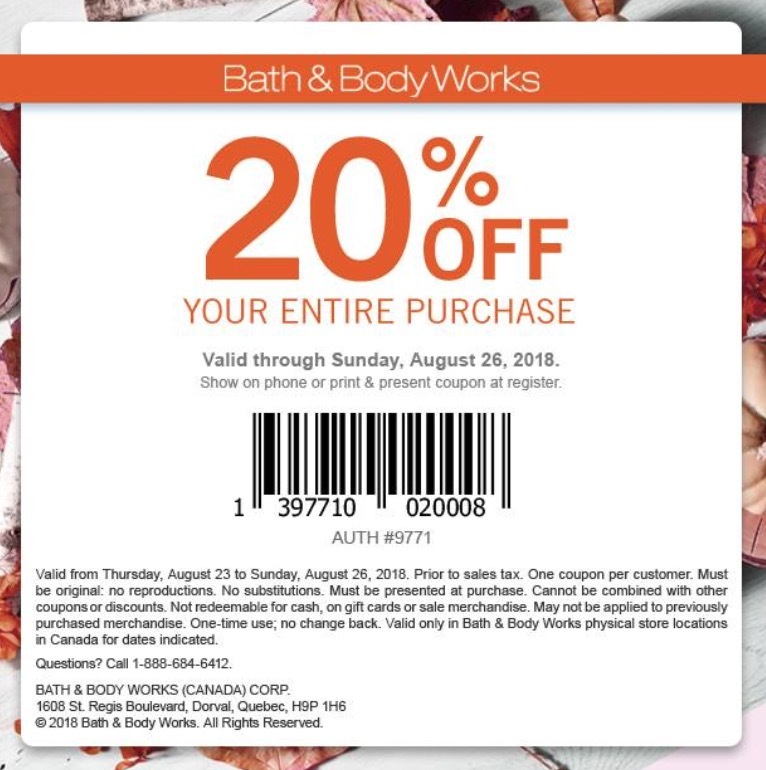 Bath & Body Works Canada has a new Coupon available now that includes: : Save 20% off your entire purchase. 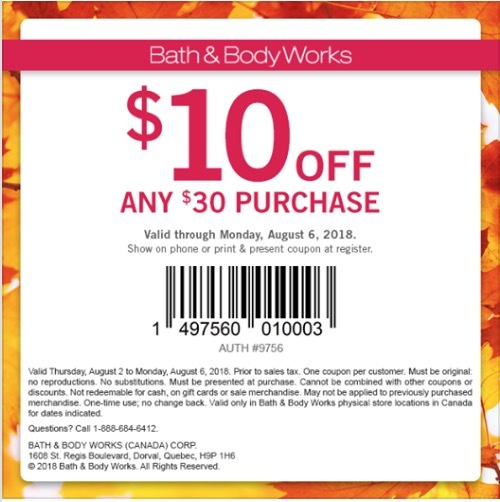 The Bath & Body Works Canada coupon is valid until August 26, 2018, in-stores only, on selected styles, while supplies last. Selection may vary by store location. Click here to find Bath & Body Works Canada near you. 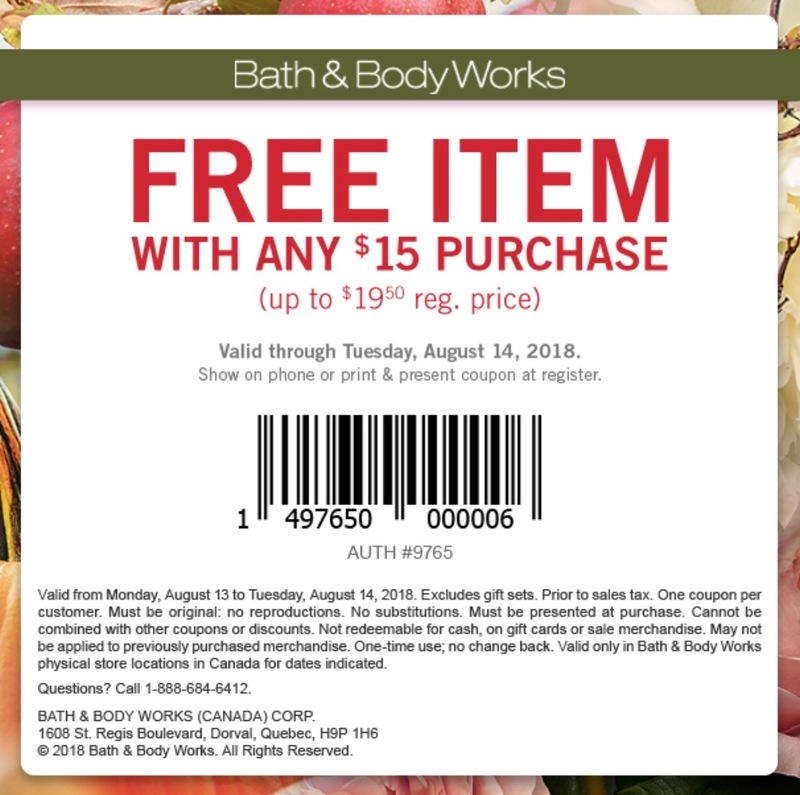 Bath & Body Works Canada Coupon: FREE Item ($19.50 Value) with Any $15 Purchase + More Deals! Bath & Body Works Canada has released some great deals! First, you can any $30 purchase using . Simply show on your phone or print and present coupon at register. Furthermore, you can get 3-Wick candles for $13.50! These deals are valid through August 6, 2018. Click here to find Bath & Body Works Canada near you. Bath & Body Works Canada has released some great deals! First, you can save $10 off any $30 purchase using the coupon below. Simply show on your phone or print and present coupon at register. 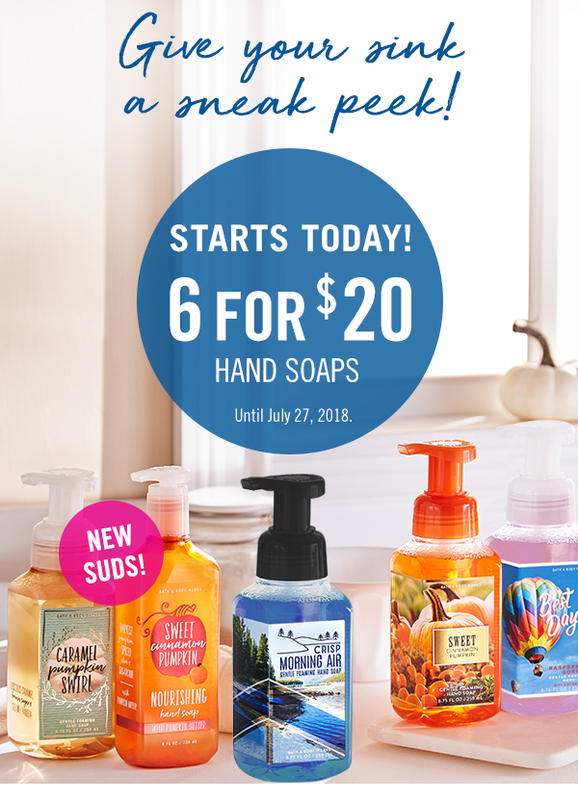 Furthermore, you can buy 6 Hand Soaps for $20! These deals are valid through July 27 2018. You can also get 3-wick candles for only $15 and buy 2 get 2 free on select body care products Click here to find Bath & Body Works Canada near you. 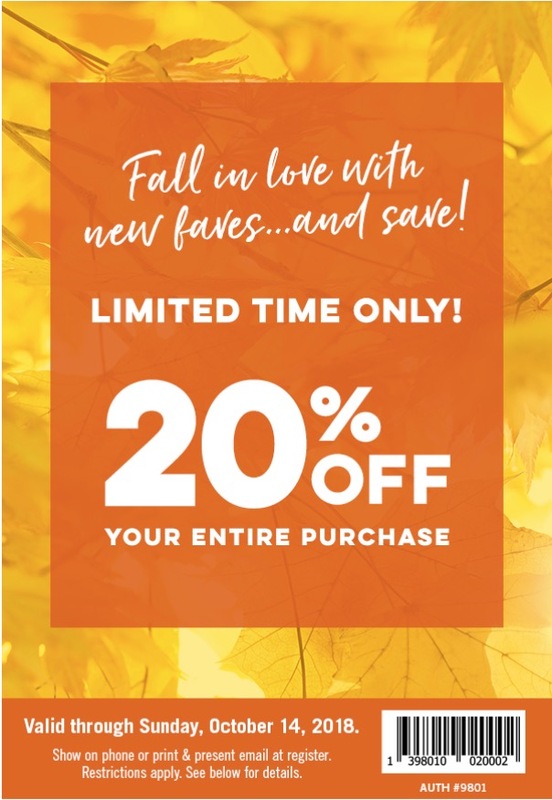 Bath & Body Works Canada has a new Semi-Annual Sale & Coupon available now that includes: : Save 20% off your entire purchase. The Bath & Body Works Canada coupon is valid until July 23, 2018, in-stores only, on selected styles, while supplies last. Selection may vary by store location. Click here to find Bath & Body Works Canada near you.